While all those cold viruses are doing the rounds, I recommend using elderberries as a preventative medicine and to speed recovery – elderberries have been used traditionally in herbal medicine for prevention and treatment of colds and flu and recent research has confirmed this application. Many studies have been carried out on the antiviral and immune-boosting properties of elderberries, with a major focus on use in influenza; a clinical trial involving 60 patients with flu-like symptoms found 15ml of elderberry syrup daily decreased recovery time by 4 days on average compared to placebo (Zakay-Rones et al., 2004). In addition, a very recent trial involving 312 long-haul aeroplane passengers found that elderberry significantly reduced duration and symptoms of colds as well (Tiralongo et al., 2016). pour into ice cube bags (or trays). (An alternative is to add sugar to the liquid and make a syrup but I prefer to avoid sweeteners if possible). 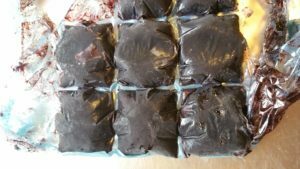 I add a frozen block to a berry smoothie with other favourite smoothie ingredients or to a cup of hot lemon, honey, ginger and chilli for a potent cold remedy. Tiralongo E, Wee SS, Lea RA. (2016) Elderberry Supplementation Reduces Cold Duration and Symptoms in Air-Travellers: A Randomized, Double-Blind Placebo-Controlled Clinical Trial. Nutrients. 8(4):182. Zakay-Rones Z, Thom E, Wollan T, Wadstein J. (2004) Randomized study of the efficacy and safety of oral elderberry extract in the treatment of influenza A and B virus infections. J Int Med Res. 32(2):132-40.